Audi has revealed plans to offer cameras which will be used as “virtual exterior mirrors” instead of the conventional side mirrors. This would make the e-tron the first vehicle to offer such mirrors. These cameras which would substitute for the mirrors would be offered as optional equipment in the markets where it is legal to use them. The use of cameras instead of mirrors was approved by European regulators back in 2016 and many leading automakers were engaged in the race to become the first to the market with the new technology. With the deployment of this innovative technology in the e-tron, Audi has pipped BMW to the finish line as the Audi e-tron will be the first series-production vehicle to have cameras instead of side mirrors. In the case of concept vehicles showcased by Nissan and Cadillac, the mirror units themselves housed a digital screen. 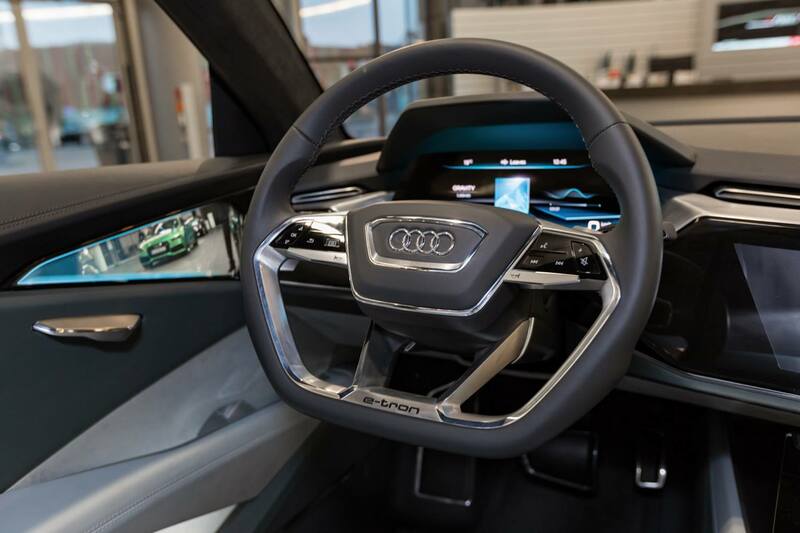 In the case of the e-tron, the footage captured by the cameras is displayed on OLED displays which are located between the instrument cluster and the doors. Thus, the drivers can opt to choose one of three different viewing modes, depending on what they are doing: highway driving, turning, and parking. Using features like these, the innovative fully electric crossover will be able to achieve a remarkably low drag coefficient of 0.28 as the vehicle becomes lighter and more efficient aerodynamically. When these mirrors are used, the width of the E-tron would be reduced by a significant 15 centimeters (5.9 inches). Just a reduction of only a 100th of the drag-coefficient figure can add or subtract about 3.1 miles of battery range. With these cameras, the e-tron has a claimed drag coefficient of 0.28. In addition to reducing the aerodynamic drag, the mirrors would also diminish wind noise.